The Town pay �10,000 compensation to Port Vale, and appoint Bobby Smith as the new manager. He signs a new strikeforce - bringing Andy Rowland and Alan Mayes to the club, and despite a sticky start to the season, they help the Town to make a bid for promotion. Three consecutive wins at the beginning of May push the Town into third place, and they seem set to go up - but two defeats in their final two games, at Sheffield Wednesday and Blackpool, sees them slip down to fifth place. Another average season - Swindon end up one place higher than the previous year, in 10th place. John Trollope decides to retire from playing in March - having made 832 appearances - but he returns just three games later, and plays another ten games before the season is out! At the end of the season, Trollope is awarded the MBE, and the board announce they are looking to replace Danny Williams as manager. A good start to the season sees Swindon occupying second place in the table early on - but soon, mediocrity sets in, and they end up in a mid-table position - but nevertheless, an improvement on the previous season. 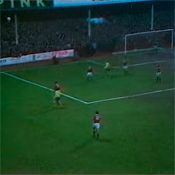 The main interest though comes in the FA Cup, when the Town wallop Fulham, who have George Best and Rodney Marsh in their line-up, 5-0 in a Third Round replay. 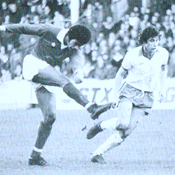 In the next round, Kenny Stroud scores a goal voted as ITV Goal of the Season, to equalise against Everton at the County Ground, before the Town are beaten 2-1 at Goodison in a replay. Hopes for the new season are high, but these are soon curtailed when Swindon win just one of their opening eight league games, and are rooted to the bottom of the table by mid-September. Come January, the Town are still in the relegation zone, five points from safety, until a spurt of four wins and a draw lifts them to 17th position. They get sucked back in though - losing four on the trot and drawing the next two, the last game of which marks the return of Don Rogers - who comes as part of the deal that takes Peter Eastoe to Queens Park Rangers. Though he wasn't quite the player of old, Rogers' return inspires the Swindon crowd and ultimately the players - who win five and draw two of their final nine games to steer the Town clear of the drop zone. The Town almost bounce back at the first time of asking - Peter Eastoe helps himself to 31 league and cup goals, to finish as the League's leading scorer - but a run of four straight defeats in February costs Swindon a realistic chance of promotion. They win five of their last six to finish in fourth place, just two points off a promotion slot. A good start to the season proves to be a false dawn, and from mid-September to mid-October, Swindon score just one goal in eight games - and to make matters worse, Welsh international Rod Thomas is sold to Derby County for �80,000. By the turn of the year, the Town had won just four matches and had failed to win away from home - picking up just two points. They win on New Year's Day at home to Preston - but then fail to win any of their next fifteen matches - and Allen is shown the door in February, after a 4-1 reverse at home to Notts County. Spirits are lifted when the board re-appoint Danny Williams as manager - and he signs loan star Peter Eastoe on a permanent basis, for a record �80,000. By now though, the writing is on the wall - and despite back-to-back victories in April, Swindon are stranded at the bottom of the table at the season's end - ten points from safety. Following the departure of Arthur Horsfield, Mackay broke the club record to buy Ray Treacy from Charlton for �35,000. With payments being made to fund the building of the new North Stand, the club found themselves in dire financial straits, and the entire playing staff was put up for sale in October. 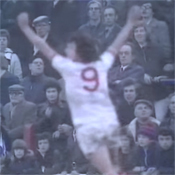 Going into November, the Town sat just two points from the relegation zone, when the unthinkable happened - Don Rogers was sold to Bert Head's Crystal Palace for �147,000 - smashing the club's record transfer sale. Mackay then paid �60,000 to Southampton for Tommy Jenkins as a replacement - but within days, he resigned from his position, citing the reasons for his departure as personal. 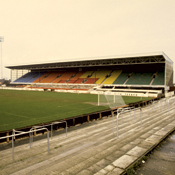 Shortly afterwards, Town fans were incensed to find out that, less than a week after selling Rogers, Mackay had been installed as manager at Nottingham Forest. It was left to chief scout Les Allen to take up the managerial reins and pick up the pieces - and he guided the Town to the safety of 16th place - just three points clear of the drop zone. 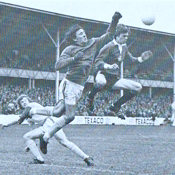 On May 1st, at the age of 29, John Trollope became the youngest player ever to have played 500 league games. The signing of Mackay provided Ford with a selection headache - he played the same position as captain Stan Harland - so to appease the board, and rather than drop Harland, he moved him into an unfamiliar midfield role - Mackay taking over his position and the captaincy. The results weren't good - and with the Town languishing in mid-table, four points from the relegation zone, Ford was sacked in early November - Mackay taking over the reins immediately. The attendance record was broken when Arsenal visited the County Ground for an FA Cup tie in January, 32,000 people cramming in to see a 2-0 defeat for the Town, who ended the season in 11th place. After two great years of success, the season is a disappointment, with the Town finishing up in a mid-table position - losing just two matches at home, and winning just three away. A run of four defeats in early March prompts the board to consider Fred Ford's position - and in early April, they buy former Footballer of the Year, Dave Mackey from Derby for a record �20,000 - with a view to him becoming manager, and Ford reverting to a Chief Scout role. 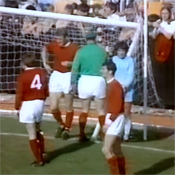 However, Mackay refused to take the manager's job - and Ford continued into the next campaign. Shortly before the new season, Swindon are rocked by the resignation of Danny Williams, who leaves to take over at Sheffield Wednesday - though not before he signs striker Arthur Horsfield for a record �17,500. Fred Ford, a coach with the club two years previously, is persuaded to leave Bristol Rovers to become Williams' successor. As they are not a First Division club, the Town are not eligible to enter the Fairs (now UEFA) Cup, and so the League organise a two-legged match with AS Roma, as way of recompense - in the grandly titled Anglo-Italian Cup Winners' Cup. 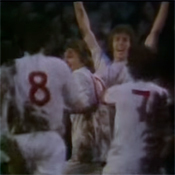 After losing the first leg in Rome 2-1, Swindon shock the Italians in the second leg, Horsfield scoring a hat-trick in a 4-0 win. The Italian FA are so impressed, they quickly go about arranging a second competition, to be played at the end of the campaign. In the meantime, the league campaign goes well, and though the Town never really look like making a bid for promotion, they finish in a very respectable 5th place - a new club record, and they also reach the quarter-finals of the FA Cup - though their defence of the League Cup is halted by an early defeat at the hands of Oxford United. 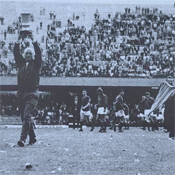 At the end of the season, Swindon are entered into the inaugural Anglo-Italian Cup, featuring sixteen teams - eight from Italy, and eight from England. They defeat Napoli and Juventus in the group stages to top the English half of the competition - and thus go into the Final, where they play Napoli on their own ground. Again, they shock Italian football by taking a three goal lead - and eleven minutes from the end, the match is abandoned when the Napoli supporters start to throw concrete blocks onto the pitch in disgust at their team's performance. Nevertheless, the cup is awarded to Swindon - and they take home their third piece of silverware in just two seasons.